I don't know about you, but I often find myself driving through rural areas past farms and fields, and unless it's some easily identifiable crop (like corn), or has a distinctive smell (like mint), I'm pretty clueless as to what the farmer is growing. In this bulletin, contributor Anthony Boutard of Ayers Creek Farm gives an idea of what we may be looking at. Through the course of the year, we make several trips down the Willamette Valley to Sweet Creek Foods in Elmira. 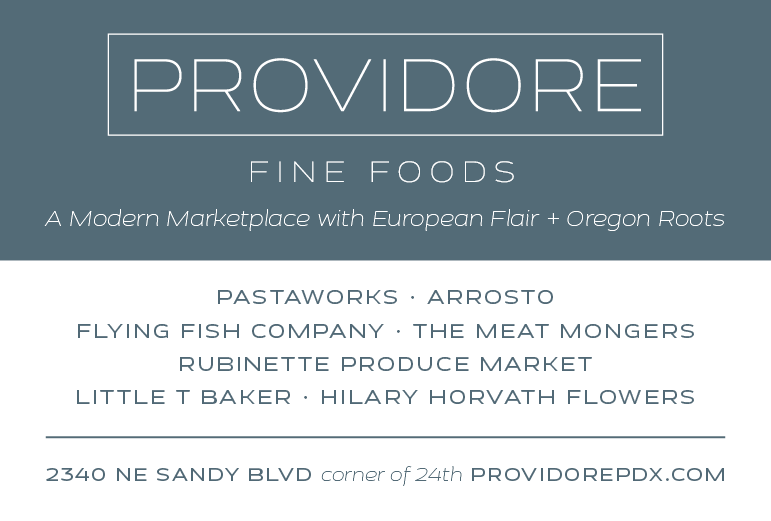 The trip takes us down the most beautiful part of the Willamette Valley. We have a choice of 99E or 99W, both slice through fertile farmland. 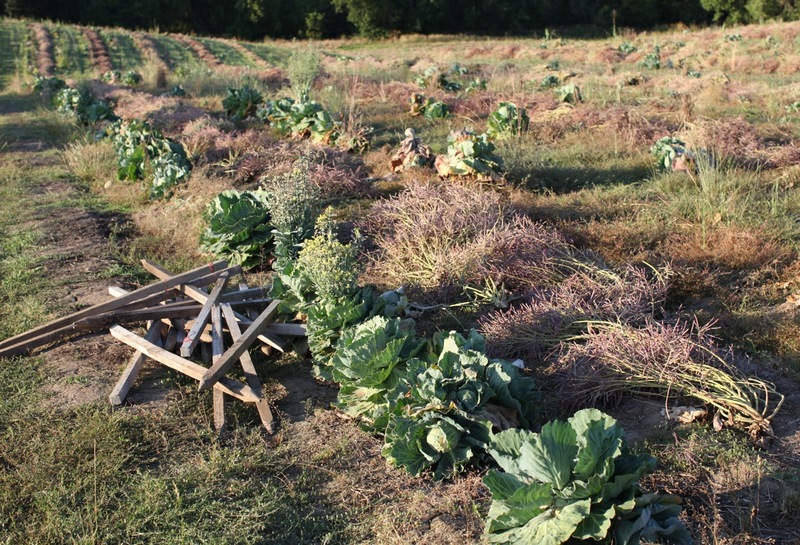 Late last summer, we noticed a small cabbage field just south of Alder Swale outside of Amity. By the time we traveled down to make our preserves in late October, the cabbages had headed up nicely. Fifteen years ago, we might have assumed those cabbages would be shipped up to the Steinfeld's sauerkraut plant in Scappoose. However, in 2001, the company decamped to Illinois. The previous owners of our farm grew pickling cucumbers for the company, and one reason we own our farm now is the gradual withdrawal of Steinfeld's from Oregon in the late 1990s. 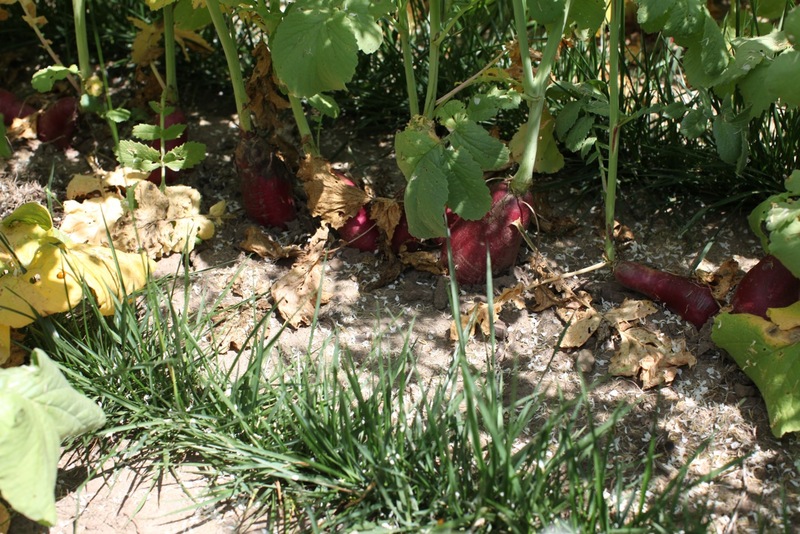 Seed radishes interplanted with grass in Gaston. At the end of March, we visited our friend Alice Doyle at Log House Plants in Cottage Grove. Alice has become the nation's leading expert on grafting tomatoes. As with other fruit crops, the grafter matches the tough, almost wild nature of a specially bred root stock, with a scion producing high quality fruit. New techniques have revived this old method of improving fruit grown as an annual, in particular, the development of a soft, silicone grafting clamp coupled with better characterized plants for root stock developed in the Netherlands and Israel. On the way back up 99W, we passed the cabbages and they were in full bloom. No cabbages had been harvested and field was carefully tended, indicating that the farmers were interested in something other than slaw or crocks of kraut. 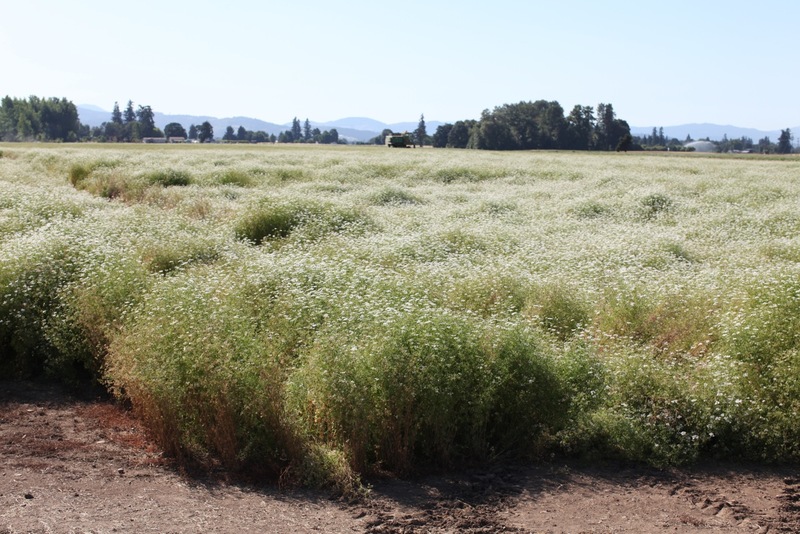 Passing the field in July, seed pods had formed and the plants were carefully staked to prevent the stalks from breaking. By now it was obvious that the field was planted as a seed crop. On Wednesday, another trip down the valley, and the stalks were cut and laid in rows, a process called swathing. This allows the seed to mature, cure and dry in the pod. Left on the plant, the pods would ripen, dry and shatter, spreading the seed in the field. Swathing makes the harvest of the seed manageable. Each plant produces about a half pound of seed. Our guess is that the seed crop is a valuable F1 hybrid. There are cabbages which do not produce viable pollen, called "male sterile" in the trade, and they are inter-planted with a pollen-producing variety. The resulting seed produced by the male sterile plants will be a controlled hybrid with carefully defined characteristics. The pollen bearing plants are removed from the field, leaving just those bearing the desired F1 hybrid seeds. The first male sterile cabbages were discovered in the 1940s. As with Alice's grafted tomatoes, carefully matching the characteristics of the pollen and seed bearing plants is important, and the heart of hybrid production. Field of coriander in flower. 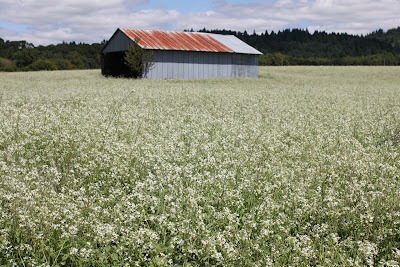 All through the southern Willamette Valley, there are seed house offices. The seed houses, headquartered in the Netherlands, Denmark, Canada and elsewhere, contract with growers to grow the crop. 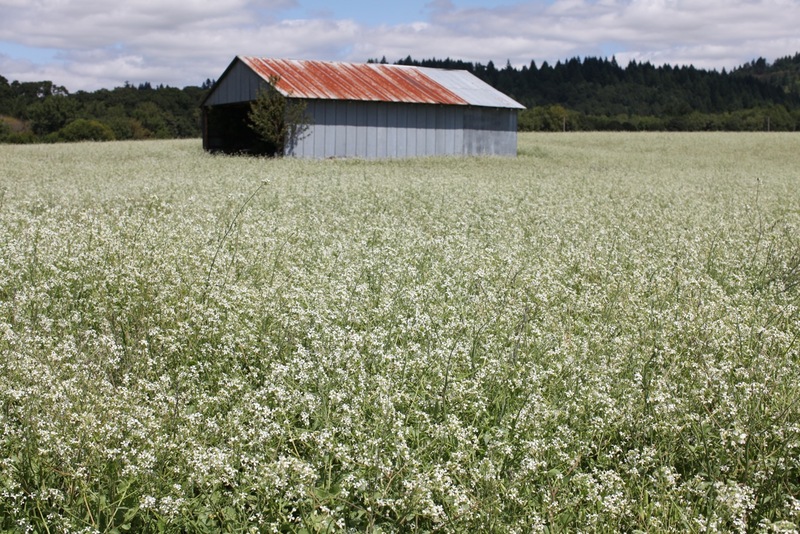 If you open a seed catalogue and order beet, spinach, chard, coriander, radish, or cabbage seed, chances are the seeds originated in the Willamette Valley. In particular, the valley is well suited to growing winter annuals. Just down the road from us, a farmer is growing a large field of French Breakfast radish seed (top photo). The pretty little cylindrical radishes are now in full flower. The field is growing two crops at once. Radish and grass seed were planted together, and when the radish seed is harvested the grass will continue to grow and produce a seed crop next year. Just south of Halsey, there are several large fields of coriander in full bloom, with the characteristic fragrance of cilantro, as it is also known. Radishes, cabbages and other members of the Brassica family, along with coriander, are insect pollinated. 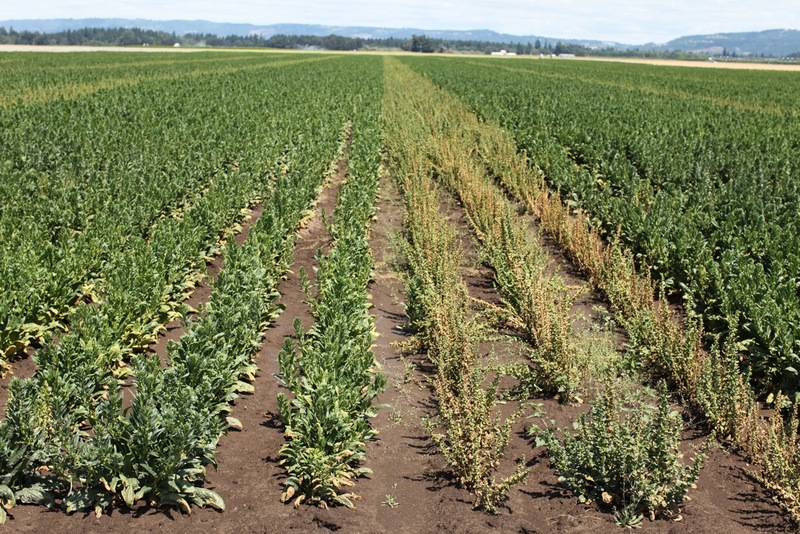 Spinach, chard and beets are wind pollinated, and are naturally dioecious, with pollen and seed borne on separate plants. If you pass a field with a distinct alternating pattern of a two or three rows of smaller plants, and ten to 15 rows of larger plants, it is probably one of these three crops. The larger plants produce the seed. This year, there are a lot of spinach seed fields planted in the valley. Hybrid seed corn, also wind pollinated, is planted with a similar alternating pattern. The plants destined to produce seed are detasseled. To keep the various varieties true to type, seed producers must isolate their fields from similar crops. The distance varies by crop and pollination method. To sort it all out, the normally secretive seed companies use a pinning map posted on the neutral ground of the local extension office. Seed production is a challenging and exacting form of industry. We produce a substantial amount of our own seed on the farm, and we will stress again that the reason is quality and variety choice, not economics. Buying seed is cheaper and easier, and we are grateful for the good seed breeders out there.